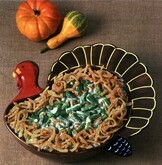 Green bean casserole is a staple on many Thanksgiving tables across America. 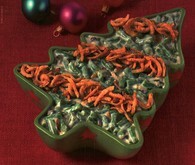 Our family likes it so much, we also serve it for Christmas dinner as well. Born in an era (1955) when creamy soup was considered a gourmet touch, Campbell’s green bean casserole recipe has endured the test of time. It was made using 2 pantry staples of the 1950s: green beans and cream of mushroom soup. The dish was created by Campbell’s kitchen manager, Dorcas Reilly, and it was originally called "Green Bean Bake". It is estimated that green bean casserole will appear on 30 million tables this holiday season. There are lots of ways that people have modified the traditional green bean casserole that’s printed on the back of most Campbell’s products.